Engineers are threading circuitry into clothes to create comfortable devices that could make electronic fashion the future of the textiles industry. Smart textiles, where electronics are incorporated into fabrics, have been around for some time, from sensor-laden shirts that keep you cool, to dresses packed with LEDs. Despite these innovations, even the most determined shopper would struggle to find this type of fashion on the high street. Dr. Ana Neves, a researcher from the University of Exeter in the UK who specialises in wearable electronics, thinks bulky design is partly to blame. "The user needs to feel comfortable," she said. "Most smart textiles still rely on integrating conventional electronics onto fabrics, attaching them to the surface and removing them when the textile needs to be washed." As part of the E-TEX project, Dr. Neves and her colleagues are using a different strategy, by building devices directly into the fibres of textiles using flexible and lightweight components. A t-shirt, for example, could be designed to monitor the wearer's heartbeat without the need for embedded electronics. The idea for the project came about in 2014 when Dr. Neves developed a technique to make textile fibres conduct electricity by coating them with graphene. She then decided to apply the method to incorporate electronics into clothing. The properties of graphene are ideal for use in textiles. The semi-metal is just a few atoms thick, making it extremely lightweight, and it can be bent and even stretched while remaining robust. It is also transparent, which makes it suitable for light-emitting displays. Furthermore, applying a coating to fabrics should be easy to integrate into existing clothing production. "If we simply add a step or two, the chances of this type of technology being adopted will be significantly higher than if we tell a manufacturer that they need to completely reformulate their production lines," said Dr. Neves. So far, the team has built a type of fabric display using light-emitting materials. By sandwiching doped zinc sulphide between two layers of graphene – which act as conductors – the researchers made it glow. They then incorporated this set-up into an array of fibres, structured like a woven textile, to create a fabric wherein the intersection of fibres lit up like pixels when plugged into a power source. Changing the light-emitting materials produces different colours. "It can be used to make a coat or a rucksack visible at a distance," said Dr. Neves. "For example, if a child is lost, activating the light emitting fibres would increase visibility, helping search and rescue teams to spot them from a helicopter." In the future, the E-TEX team hopes to harvest energy from a person's movements so that the fabrics can be self-powered. As flexible, plastic solar cells become more efficient, they could also be incorporated as a power source. According to Henry Yi Li, professor of textile science and engineering from the University of Manchester, UK, 'e-textiles have become one of the major focuses in wearable technology." But one of the problems with integrating electronics into clothing is connecting them all together. Traditional wires are bulky and don't fit seamlessly into fabric. Prof. Li is part of a project called ETexWeld, which is trying to better incorporate electronic components such as sensors, circuits, apps and power sockets into clothing. He and his colleagues are starting from square one. "We are developing electronic components by starting with yarns or individual fibres," he said. The researchers have been experimenting with different strategies that could be either used on their own or combined. Developing conductive fibres and yarns is one solution, as microelectronic components and circuits can then be woven, knitted, sewn or embroidered into the fabric. 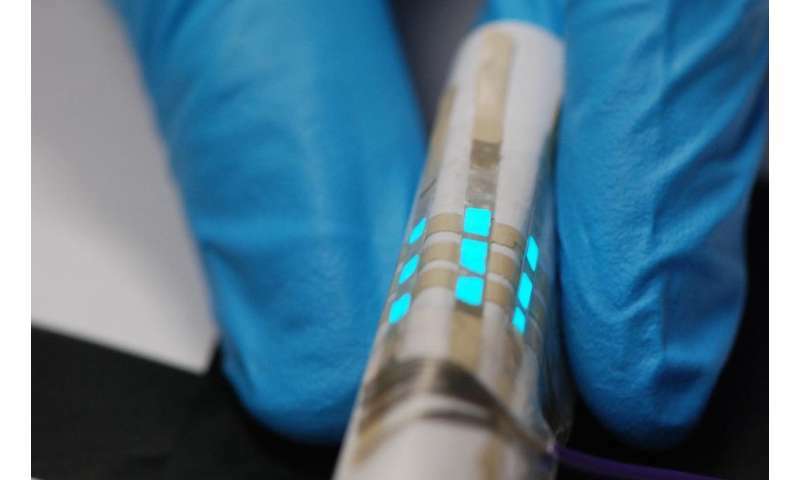 Printing conductive ink onto a textile is another possibility. One of the big challenges is protecting the electronics so that they are washable and can withstand sweat and moisture, as well as the mechanical stresses and strains due to body motion and physical activities. "Electronic elements and connecting wiring can be encapsulated and protected by welding insulation tapes and/or embroidery techniques," said Prof. Li. The focus of the project so far has been to make a smart uniform for fireman that integrates the required functionality while putting out a blaze. For this, sensors are needed to measure temperature and humidity, while a fireman's location and movement must also be relayed to other members of the team – and that would need to be communicated wirelessly. The team has developed an algorithm that can determine whether a fireman is in danger or not by integrating data collected from different parts of the suit. It can also predict whether certain work patterns are likely to be risky. The project involves an international team, with members in Turkey, Greece, France, England, Slovenia, Taiwan and Hong Kong, which has allowed it to tap into the expertise of each region. In Taiwan and Hong Kong, for example, companies are already manufacturing and selling e-textile products. "The collaboration certainly helps us to move from lab work to developing commercial prototypes," said Prof. Li.